The Democratic Front, a conglomeration of four political parties in the hills, today alleged that police were acting in a partisan manner as they had not prevented the Trinamul tea garden trade union from carrying out a relay hunger strike. 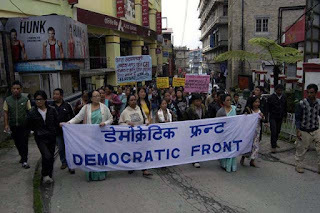 The leaders of the Front have alleged that when Bharati Tamang, the widow of former ABGL chief Madan Tamang, had started a fast-unto-death on June 14 at Chowrasta to demand the arrest of 23 leaders of the Gorkha Janmukti Morcha, including Bimal Gurung, senior police officials had reached the spot and requested her to lift the hunger strike. An empty police bus was also sent to Chowrasta. Trinamul's trade union, Darjeeling Zilla Tea Employees' and Workers' Union, launched a relay hunger strike at Upper Clubside here from yesterday demanding the fulfilment of a set of demands pertaining to the closed Pussimbing tea estate in Darjeeling. The spot where Bharati Tamang sat on a fast-unto-death at Chowrasta on June 14 and the venue where Trinamul supporters are sitting on a relay hunger strike are about 500 meters apart. "There is no doubt that there are two sets of rules in the hills. One is for those who are in power, and other for those who are not with them. 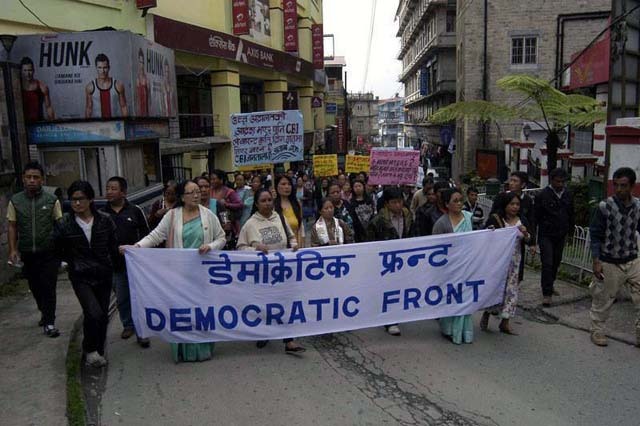 Cases have been slapped on us when we proceeded to go for an indefinite hunger strike," said Pratap Khati, the convener of the Front. "We are filing a writ petition in Calcutta High Court tomorrow against slapping cases on us. All these instances will be mentioned in the petition," he said. Bharati had withdrawn the fast on June 16.